It’s a hive of activity behind the scenes at Otaki Museum as work continues on a new exhibition commemorating World War 1. 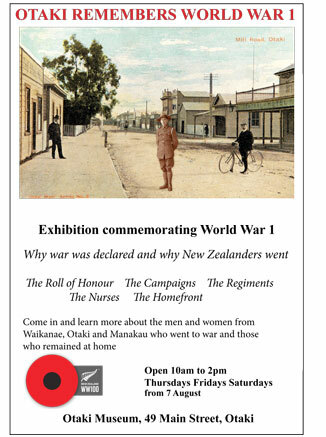 The exhibition Otaki Remembers World War 1 opens on Thursday 7 August and runs until the end of April 2015. New Zealand’s population in 1914 was just over one million. A main feature of the exhibition is the Roll of Honour with the names of 400 men and women from Otaki, Waikanae and Manakau who served in the war. Many of these names will be well known to local people today. The Roll of Honour will be displayed throughout the entire exhibition and new material marking significant periods of the war, including Gallipoli and the Armistice will be installed at later stages. Other features of the exhibition include information on why the war happened and why New Zealand was involved. Folders containing the stories of soldiers from Otaki, their regiments and the campaigns, and the horses from New Zealand that went to war will be available for visitors to read. The nurses who served in the New Zealand Army Nursing Service Corp and life in Otaki during the war years are other features of the exhibition. At least six women from Otaki or with Otaki connections are known to have served as nurses. Supporting the troops was a major focus for NZ-ers who stayed at home. A Patriotic Committee formed in Otaki collected money and goods for the war effort. Photographs of the New Zealand Mounted Rifles and Imperial Camel Corps are also on display. Exhibition planning team members Rex Kerr and Jan Harris say much careful thought has gone into deciding the content of the displays. “We thank the local people who have donated letters and other items from family members who served in the campaigns,” Rex Kerr says. The museum has received funding for the exhibition from the New Zealand Lottery Grants Board and Otaki Community Board. Photographic panels have been given by the Woodville Museum and uniforms worn by soldiers and nurses are on loan from Levin Little Theatre. The exhibition will be officially opened at 3pm on Tuesday 5 August. The date marks 100 years since Great Britain declared war on Germany. 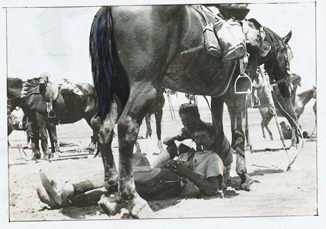 Soldiers of the New Zealand Mounted Rifles resting in the shade of their horse. Powles family: Photographs. Ref: PA1-q-604-2. Alexander Turnbull Library, Wellington, New Zealand.